A SpaceX upgraded Falcon 9 rocket stands poised to launch the SES-8 communications satellite into orbt from Cape Canaveral Air Force Station in Florida during a Nov. 28, 2013 launch attempt, which was ultimately aborted due to a technical glitch. SpaceX plans to launch the mission on Dec. 3. The private spaceflight company SpaceX is counting down to launch a critical commercial satellite mission from Florida today (Dec. 3) after two delays due to technical glitches, and you can watch the liftoff live online. 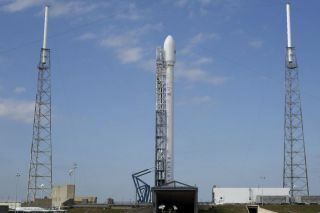 An upgraded SpaceX Falcon 9 rocket is set to launch the huge SES-8 communications satellite into orbit from a pad at the Cape Canaveral Air Force Station at 5:41 p.m. EST (2241 GMT). The mission will mark SpaceX's first Florida launch of its upgraded Falcon 9 rocket, its first major communications satellite launch and its first flight to a high geostationary transfer orbit needed for commercial satellites. The mission has a 66-minute launch window, with Wednesday reserved as a backup day, SpaceX officials said. "All known rocket anomalies have been resolved," SpaceX officials wrote in a status update Monday (Dec. 2). SpaceX has much riding on a successful launch today. Sending the 6,918-lb. (3,138 kilograms) SES-8 satellite into its intended orbit, which ranges from 183 miles (295 kilometers) above Earth at its nearest point and 49,709 miles (80,000 km) at its highest point, will mark the company's entry into the commercial satellite market. The SES-8 satellite is a hybrid Ku-and Ka-band spacecraft built to provide high-definition telecommunications services to customers across the South Asia and Pacific region. "The entry of SpaceX into the commercial market is a game-changer," SES chief technology officer Martin Halliwell told reporters in Nov. 24 teleconference before SpaceX's first launch attempt. "It's going to really shake the industry to its roots." SpaceX has launched six Falcon 9 rocket missions since the booster's debut in 2010, but most of those were either test flights or missions for NASA to deliver cargo to the International Space Station using the company's unmanned Dragon spacecraft. SpaceX has a $1.6 billion contract to fly 12 cargo missions to the space station for NASA. Two of those delivery flights have already been launched. The two-stage upgraded Falcon 9 rocket, called the Falcon 9 V1.1, stands 224.4 feet (68.4 meters) tall and is designed to loft both satellites and the Dragon spacecraft into orbit. Its protective payload fairing is 17 feet (5.1 m) wide, large enough to fit a bus inside. The rocket made its first test flight on Sept. 29 to launch a space weather monitoring satellite for the Canadian Space Agency from SpaceX's pad at California's Vandenberg Air Force Base. That mission successfully tested several major upgrades to the Falcon 9 rocket, including more powerful Merlin 1D rocket engines (also made by SpaceX), a triple redundant avionics system and enhancements made as part of the company's reusable rocket program. Unlike early Falcon 9 rockets, which arranged their nine first-stage engines in a three-by-three block, the Merlin 1D engines on the upgraded booster are placed in a circular "Octaweb" pattern for better performance, SpaceX officials have said. The only glitch on the September test flight was the failure of the Falcon 9's second stage to restart in orbit, a capability it must perform to make today's launch a success. SpaceX founder and CEO Elon Musk has said the glitch was traced the cause to a frozen igniter fluid line. The affected system has been shored up with additional insulation to prevent freezing on the SES-8 satellite launch, he added. Musk founded SpaceX in 2002 with the goal of developing affordable and reliable rockets and spacecraft. SpaceX currently advertises standard Falcon 9 rocket launches for $56.7 million.